Buddy 2012 - Our Elf on the Shelf arrived at the door in his box along with the book. It wasn't long before he had set up watch on the Reindeer. Buddy played with Dimples cars all night by the looks of things. Buddy also drew funny faces over Mum & Dad. Giving them red noses. 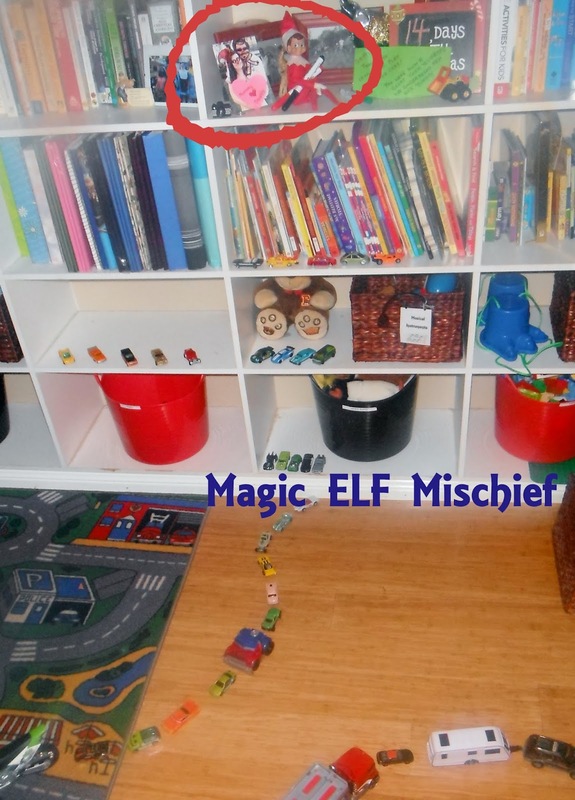 Dimples thought this was hilarious and grabbed his little camera to take some pictures of his naughty Elf. Buddy called a Christmas meeting through the night with Fellow Christmas figures around their own tree. There is little Elf foot prints coming from the fire place, he must of made these when he returned from visiting Santa. Dimples was definitely excited that he had a magical Elf visiting until Christmas. One night Buddy decorated a Santa cookie and turned our Milk Green. Buddy left Dimples some craft, a collage of a tree. You must have used every one of the scissors. Whoops Buddy forgot to shut the fire Place door again when he returned from reporting to Santa that night. Buddy the Elf likes Green. He raided the drawing box one night and found all the green texters. ZOO. Dimples awoke to find that his table had been turned into an Animal cage. Buddy had used all the sticky tape to contain Dimples stuffed toys. There was a do not touch sign on the sticky tape so buddy had electrified it to contain the animals through the night. Dimples woke up one morning to see Buddy fishing in the fish tank. He had been drawing fish and looking up Rex Hunt by the looks of things and then decided to go for a fish himself. He had bought Dimples back a snow man from the north pole but he melted through the night. 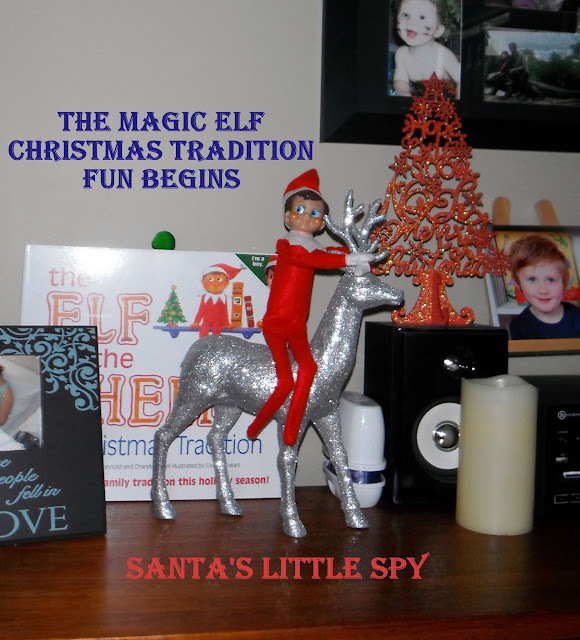 Buddy found a Elf friend and has enrolled him into the mischief making. Here he is having a ride on the reindeer. This was a beautiful handmade gift from a fellow Australian Kid Blogger Network Member. How much fun is this idea!?! I just loved the fishing photo, had to giggle out loud, no-one knew what I was on about! Hilarious!